How do we want our mediation efforts to be reported and perceived ? Whom do we consider our most important audiences, partners and adversaries in this process? What are the messages we want to communicate publicly and which parts of the negotiations would we like to keep confidential ? Brainstorming these questions with members of the mediator’s team will elicit interesting ideas which can then be used to develop an effective communications strategy to support the peace process. Establishing credibility for the negotiator’s team as a reliable source of information for journalists and other observers reporting on the conflict. Framing, re-framing and re-defining the issues at hand: unbiased reporting and analysis can help de-conflict some of the issues and focus instead on common interests and new ideas and options. Giving members of the public a space in which to express their hopes for peace, thereby increasing public pressure on the conflict parties to negotiate and keep to their word. Managing hostile information campaigns directed at discrediting the peacemakers and that will negatively affect their image. Managing misperceptions, emotional outbursts (by parties’ representatives, opinion leaders or prominent journalists) and counteracting destabilizing reporting by ‘information doers’ (2) that could affect or derail the whole negotiating process. They serve as agenda-setters, in that media coverage or lack of it influences what people and policy-makers think about. They are formative, in that media reports frame how people see a country or organization or conflict situation, thereby influencing how a conflict is perceived nationally and internationally. They help to create lasting images of the causes and consequences of violent conflict, and of the performance of international actors in those conflicts. Kosovo 2004 – Working with the local media to counter hate messages. In the first years of an international presence in Kosovo, the Organization for Security and Cooperation in Europe (OSCE) and the UN attempted to regulate the country’s media. A Temporary Media Commissioner (TMC), appointed by the UN’s Special Representative, was to implement a temporary regulatory regime over Kosovo’s broadcast outlets, then 23 television and 70 radio stations, to prevent slander and hate speech. However, in the spring of 2004 local media reports incited crowds in the town of Mitrovica to violence which led to the destruction of religious sites, 19 people dead, 900 injured and 4000 left homeless. The process of reconciliation between the ethnic groups experienced a significant setback. There are now a growing number of actors in an increasingly diverse media environment. Private citizens using smart phones and video recorders are able to relay visual images to diverse media outlets, and traditional journalism is at times replaced by ‘citizen media’. Observers in the conflict theatre can post potential news items to various social and professional websites in all parts of the world. (7) Many non-governmental organizations with a stake in the negotiations have their own staff and supporters relaying information to their head offices. Furthermore, the protagonists in the conflict may have their own media outlets,(8) constantly feeding information, or disinformation, to their supporters and to their own ethnic or diaspora media. Rapid information dissemination has now become an important tool for most conflict parties. While mainstream media are not necessarily in the front line of these ‘information wars’, they can pick up relevant news snippets from these diverse sources without thorough verification, thereby exacerbating pressures on negotiators at the international level. News is now created in an instant and the lead-time to react to emerging news about one’s organization or peace mission is at best several hours, sometimes only minutes. Nik Gowing of the BBC has termed this challenge a ‘new tyranny’, which often creates news reports that are ‘first, fast but flawed’. For governmental policy-makers, this may rapidly create a media crisis which, according to Gowing, many perceive as formidable if not frightening. (9) As a result, governments and inter-governmental organizations have lost their monopoly on information management to a diverse group of non-state actors with access to a variety of information channels. In the face of such an abundance of ‘information doers’,(10) mediators need to plan and develop information campaigns to influence how people see an international mission and to ensure successful implementation of their mandate. Successful negotiators, such as Martti Ahtisaari, former President of Finland and recipient of the Nobel Peace Prize, have long adopted this approach. In his decades of negotiations on Namibia, Kosovo and Northern Ireland, Ahtisaari decided that information capacity must be part of the peacemaking strategy. In the case of Namibia, he saw a goal-oriented information strategy as the backbone of a mission in an environment where negative campaigns by opponents of the peace process, or critical news stories about the mediator and their team, could affect or even derail the negotiations. Such a clear leadership decision is also a signal to potential spoilers of the peace process, whether internal opponents or external foes, that the peace mission is prepared to pre- sent itself, and defends its positions when need be. Analysing the information environment (11) At the start of a mediation process, and in order to act effectively, mediation teams need a good knowledge of the local media landscape and information capacities. How do people get their information? What media do they mostly trust? This analysis allows the mediation team to understand which media are most used and most effective, which ones to monitor, and which ones to work with so that information reaches the largest number of people. This early analysis should include issues such as literacy and education of the population, access to and control of radio and television, cell-phone and internet usage in the coun- try and the distribution and quality of the print media. Which outlets strive for impartiality and could be considered allies in the peacemaking process? The analysis should also include the level of civic engagement, the role played by churches, mosques, teachers, students and other opinion leaders, as well as the level of open and public debate in the country. Are propagandistic or hate media active ? How do rumours spread and who are the main carriers of rumours ? The presence of international journalists covering a certain conflict may vary widely, depending on the kind of conflict and the timing of the peacemakers’ activities. Many conflicts receive very little international media attention, for reasons of political and economic salience of the area concerned, logistical reasons (geographical inaccessibility or other hurdles put in place by a party to the conflict), general security concerns, infrastructure problems or when ‘conflict fatigue’ sets in, i.e. when a conflict has been in the news but is no longer considered newsworthy. (12) In such situations, there can be a tendency towards complacency among international mediation staff who may often realize too late, as in Kosovo in 2004, that more careful attention to local media reporting could have alerted them to upcoming troubles. Peace negotiations are sometimes covered by reporters who are called ‘parachutists’: they drop in for a few days, but if talks drag on, they or their employ- ers may lose interest and move on to more newsworthy subjects. Some conflicts, such as the Western Sahara or Cyprus, then become ‘forgotten wars’, ignored by the international media for years or decades. The reverse can also occur, as in the case of Afghanistan/Pakistan in September 2001 when the sole spokeswoman of the UN Office for Humanitarian Affairs, assisted by one local staff member, who normally handled a few media requests a week, sud- denly found herself inundated with media requests from thousands of journalists after the attacks of 9/11. To understand its environment and be reactive, the mediation team needs to monitor the media and other public spaces (blogs, social networking sites, newsgroups and groups communicating with SMS-cellphones). Such an undertaking can be labour intensive but is a vital chore which should be assigned to members of the peacemaking team or other local supporters with language capacities. When media reporting about the negotiator’s activities is found to be inaccurate, corrective measures can be taken immediately, before rumours and misinformation take hold. Journalists should be aware that the peacemakers are monitoring their work, inaccuracies can be pointed out through phone calls, letters to the editor and, if necessary, press conferences. If severe cases of hate messaging occur, the top negotiator can immediately lodge complaints and intervene to check destructive communications. (13) In this case, the peace- maker’s team needs to act quickly and decisively, to prevent the distorted images from taking hold, and to anticipate further issues. When surveying the information environment in the countries or region concerned, it is important to consider the main communication partners and tar- get audiences. When time is short and the mediator’s team is small, the most important audiences for an effective communication campaign need to be identified as soon as possible. Ideally, different messages will be crafted, and possibly completely different communications approaches designed, depend- ing on the mediator’s intended target audience. A non-comprehensive list of significant players who should be regularly communicated with includes those with in-country and those with international influence.  Local organizations, activists and bloggers, including their websites, which should be monitored and understood to inform decisions on appropriate interactions. Expatriate communities and their media need to be monitored ; those who could play a supportive role should be contacted and kept in- formed as they could be helpful in spreading the peace message. These two categories often overlap as, for instance, established in-country opinion leaders may themselves have direct access to foreign policy-makers. These two categories often overlap as, for instance, established in-country opinion leaders may themselves have access to foreign policy-makers. Some negotiators instinctively prefer to ‘keep things close to their chest’ and avoid unnecessary public communications. While it is true that premature statements about initiatives and sensitive aspects of the mediator’s work can lead to confusion and could undermine negotiations, it is equally risky to be seen as secretive or unnecessarily concealing information or confusing the is- sues. As a matter of principle, transparency should underpin the mediator’s dealings with the public and media in conflict areas. A recommended course of action would be for mediators to be as open and transparent about the process as possible, while they do not necessarily need to enter into – possibly contentious – details of the negotiation. Often, the rumour mill is highly active in areas of conflict, and speculative lo- cal observers, bloggers or reporters will create a story whether the mediator likes it or not. As discussed above, it should be decided early on which parts of the negotiations to keep confidential and which can be publicly shared. In each case, the peacemakers must ask themselves : what if confidentiality is not adhered to? For this eventuality, a Plan B will ideally be prepared and go into effect when necessary. When faced with leaks from interlocutors during the Kenyan peace talks in February 2008, Kofi Annan moved the negotiations to a remote undisclosed location, effectively creating a two-day media blackout. This helped to give the negotiations breathing space necessary for the parties to reach the power-sharing agreement. The Joint Mediation Support Team was launched with much publicity and a few public- information specialists in late 2006. Despite their efforts, the 2007 peace talks in Sirte failed to attract rebel attendance. The New York Times front-page photo, featuring a lone camouflaged militant at a huge buffet table, said it all. The long and complicated Darfur peace process has been a challenge for professional communicators. The interim Joint Chief Mediator, Ibrahim Gambari, is also the Joint Special Representative of the African Union–United Nations Mission in Darfur (UNAMID). He uses the mission’s communications team to promote key moments in the peace process and urge broader commitment to the talks. But UNAMID is careful not to imply ownership of the Doha Document for Peace in Darfur (DDPD), which is the latest incarnation of the peace agreement. Not being in a position to ‘sensitise’ the population on the document of 100+ pages, UNAMID counts on the signatories – the Government of Sudan and a small opposition movement, the Liberation and Justice Movement – to do so. How fully the population is engaged is hard for outsiders to deduce. The DDPD is being disseminated in UNAMID-supported workshops across Darfur, but there is no media forum for debate. It is not posted on Sudan media websites, and UNAMID radio programming is scrubbed by Khartoum censors before broadcast. The ‘enabling environment’, i.e. freedom of speech and assembly, which some key capitals insist upon before endorsing a Darfur-based internal dialogue, does not seem to exist. With attention focused on the independence of and then crisis with South Sudan, international media have largely lost interest in Darfur, except for a few diehard bloggers. The non-signatory parties have not responded to date to public calls from the international mediator to join the process, and are openly hostile in public statements. Getting basic coverage of mediation efforts is not a problem in Sudan. But finding a credible and authoritative voice, which is accessible to and influential with all communities and which can convince parties to lay down their weapons, continues to elude communicators. Public Information can also be used to great effect in the crucial period after the agreement has been signed, in support of its understanding and imple- mentation. Between 2003 and 2005, the Centre for Humanitarian Dialogue helped the parties to the Aceh conflict implement a Cessation of Hostilities Agreement (COHA). A semi-autonomous body called the Public Information Unit (PIU) was used to clarify areas of misunderstanding and build public sup- port for the agreement. (14) Such work on public information can help parties stay on track in the post-conflict phase and monitor implementation of agreements. Sympathetic local media and NGOs can also help in the peacebuilding phase by reporting when benchmarks are missed or backsliding occurs. Although not peace-process related, the case of the 2010 cholera outbreak in post-earthquake Haiti, which UN peacekeepers were accused of having caused, illustrates how failure to consider local opinion can rapidly backlash and affect an organization’s credibility. In the presence of persisting rumours, it may be better for peacemakers to address these, rather than ignoring them. This may entail a public commitment to a prompt investigation, the investigation itself, public apologies in case of mistakes/responsibility and a commitment to avoid such mistakes or incidents in the future. Communications possibilities open to negotiators in international settings can be grouped into four basic approaches. Responding to modern communication challenges and opportunities is likely to require the mediator to use all four options, or a combination of them, at different times during a process. This approach is preferred by some ‘traditional’ peacemakers but is increasingly unlikely to succeed in times of intense media scrutiny. Its passivity allows other parties (including the conflict parties themselves) to seize the initiative and set the agenda in terms of media coverage, its tone and content. It leaves the peacemaker ‘speechless’ in the case of attacks and the peace process vulnerable and possibly destabilized. Once a public relations crisis sets in, the peacemaker will find it hard to regain the high ground – much of his or her time may be spent in crisis management. This happened during the 2007 Darfur talks in Sirte, Libya (Box 2). In the absence of key rebel groups, the joint UN–AU mediation team could do little in terms of PR efforts. The peacemaker can respond to media reports or blogs about their work and give occasional updates in press conferences and background interviews. Many United Nations officials follow this course, as for example in the Cyprus negotiations over the years. This option relies on a low-key or reactive approach, which can work when reporters and local parties are not hostile to the peace process. Once a media crisis occurs, this approach may throw the negotiator’s team into turmoil and lay the mission open to criticism. When the peacemaker cannot set the agenda directly through a visible public information mandate, he or she can help the negotiating parties in understanding the benefits of a joint approach to communication. The mediator can explain to parties that it is not in their interests to pre-empt, provoke, misinform or manipulate public perceptions. The mutually beneficial potential of open communication channels can be discussed early in the negotiations and a joint communication strategy elaborated. Should violations occur, sanctions can be applied depending on the powers invested in the mediator and the parties. The case of Kosovo was very unusual in that the ‘mediator’, the United Nations, was in control and so could apply sanctions. Sanctions were also applied in Cambodia where the UN controlled the sphere of information, according to the 1991 Paris Peace accords. But usually a mediator does not have the tool of sanctions or other forms of physical control over the parties. More often, a mediation might resort to a sanctions committee, such as the one set up by the UN Security Council in Cote d’Ivoire to limit hate media. The negotiator and his or her team can drive the communication flow about the peace process through high visibility and control of the media agenda, as Kofi Annan did during the Kenyan Dialogue 2008 (Box 3). This option needs a skilful and experienced information team with the confidence and full involvement of the negotiation leader. Communication is given a high priority; daily messaging is carefully crafted and adjusted when the need arises. The leader is a good communicator who has decided that public perceptions matter in peace negotiations. The choice of communications option will be largely context-specific. 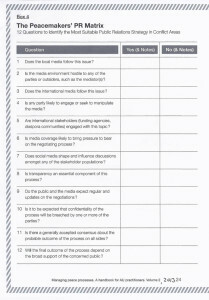 However, the PR matrix in Box 4 (developed by media professionals)(19) is a simple yet effective tool that can help mediators rapidly identify and apply the optimal PR strategy in a given peace-process situation. 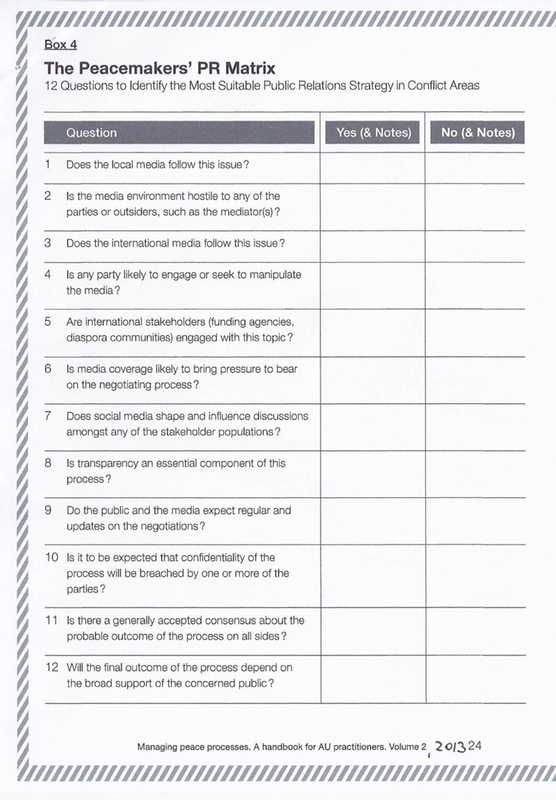 The 12 questions broadly represent the key drivers that ought to shape any peacemaker’s public-information strategy. 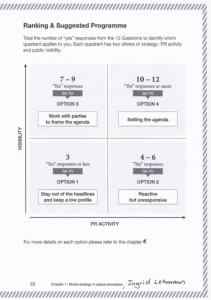 Once the mediation team has answered the questions and agreed on a diagnosis, the matrix below will point them in the direction of one of the four tactical options outlined above. While this matrix should not be taken as a ‘one-size-fits-all’ type of solution, and cannot dictate mediators’ choices, it can help mediators to initiate two important sets of discussions (diagnosis and strategy) that will be key in devising appropriate media solutions. Media and communication strategies are the result of careful analysis of the information environment in the area of operations. In developing the peace- maker’s core messages, several options and alternatives should be explored. Box 5 lists some practical steps in dealing with the media. Once agreed, the key messages should be adhered to by all members of the peacemaking team. This gives the negotiator coherence in communicating with the outside world, and may contribute to his or her leverage with the parties to the conflict. Plan early for your communication strategy: too little too late is a frequent cause of failure in this field. Choose the spokesperson and information team carefully: at least one person should be an experienced professional in this field. Leaving this sensitive subject to untrained staff can backfire. Be hands-on in identifying communications priorities and key messages. Make sure that all team members are able to articulate three key messages that underpin your communication strategy. Engage personally with key journalists and other opinion leaders – make them feel you are open and available. Hold information briefings and press conferences as the situation requires ; don’t be rigid about when and how to engage with the media and public. Before critical media encounters, press conferences and public appearances, role-play difficult questions that may be asked of you. Pay attention to the tone of your communication, e.g. whether to be assertive and firm or open and consultative. Learn the basic rules for engaging with the media: on-the-record, off-the-record, for background only, etc. Always get back to journalists with information promised: establish a reputation for reliability. If you lack experience in interviews and public speaking you may wish to receive basic media training. Adequate information strategies will be key in enabling the peacemaker to bet- ter understand the operating environment, and to communicate better the aims of the mission and the potential benefits of peace. Such strategies will further help the mediation team to mitigate spoilers’ use of inflammatory language. When the tools described in this chapter are creatively applied, they may not guarantee success but will definitely contribute to it, as the 2008 Kenya precedent demonstrates. When these tools are ignored or contravened, they will too often lead to failure. Evaluating the impact of communications strategies for peacekeeping and peacemaking would further help practitioners understand what works and what does not – something that currently remains largely unmeasured. Gowing, Nik, ‘“Skyful of Lies” and Black Swans – The new tyranny of shifting information power in crises’, Reuters Institute for the Study of Journalism Challenges Series (Oxford, UK: 2009). Haraszti, Miklos, The State of Media Freedom in Kosovo: Observations and Recommendations (3 July 2006) (http://www.osce.org/fom/19738). Heinzelman, Jessica and Waters, Carol, Crowdsourcing Crisis-Information in Disaster-Affected Haiti, US Institute of Peace, Special Report 252 (October 2010). Lehmann, Ingrid A., Peacekeeping and Public Information – Caught in the Crossfire (London: Cass, 1999). Lehmann, Ingrid A., Managing Public Information in a Mediation Process, in the Peacemaker’s Toolkit series (Washington DC: US Institute of Peace, 2009) pp11–17. Lindenmayer, Elisabeth and Lianna Kaye, Josie, A Choice for Peace? The Story of Forty-One Days of Mediation in Kenya (New York: International Peace Institute, 2009) (kenyamediation_epub.pdf). UN Department of Political Affairs (2006), Addressing the Media in Peace Processes and Agreements, Operational Guidance; note: see (www.peacemaker.un.org). Waisbord, Silvio, ‘News Coverage of the Darfur Conflict: A Conversation with Jan Eliasson, United Nations Special Envoy to Darfur’, The International Journal of Press/Politics (2008), 13, 75. Ingrid A. Lehmann is the author of Peacekeeping and Public Information: Caught in the Crossfire (London: Cass, 1999) and many articles on issues of international political communication. 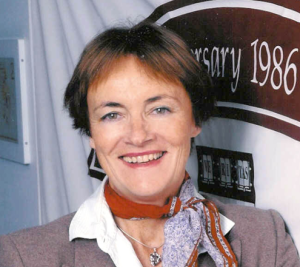 She worked in the United Nations Secretariat for over twenty years, including service in two UN peacekeeping missions, in Cyprus and Namibia. She set up and headed the Peace and Security Program Section of the UN Department of Public Information, and has held other senior positions in the UN. She has a Diploma and a Doctorate in Political Science from the University of Berlin, Germany and an MA in History from the University of Minnesota, USA. She was a Fellow at Harvard University, USA in 1993/94 and again in 2004. Lehmann has lectured in the Department of Communication Studies at the University of Salzburg, Austria and has recently joined Peacehawks as a Co-Director. Contact: ingleh@aol.com. This article was adapted from the original by this author, written for Managing Peace Processes: Thematic Questions. A handbook for AU practitioners, Volume 2, Chapter 1. For this article, the author gratefully acknowledges the inestimable assistance of Mark Arena, James Arbuckle, Jason Arbuckle, Julia Egleder, Susan Manuel, Marianne Kearney, Michael Vatikiotis, Susannah Price. The Kony 2012 video, viewed by more than 100 million people within the first two weeks of its release, is an effective example of how individuals can suddenly bring huge attention to a crisis ongoing for over a generation. See page 5 of this issue and relevant notes for more information on the multitude of people who contribute information in times of crisis. For further information on the impact of media and information politics on peacekeeping and peacemaking in the United Nations (UN), see Lehmann (1999); for the specific case of Rwanda in the mid-1990s see Linda Melvern, Conspiracy to Murder – The Rwandan Genocide (London: Verso, 2004). See Lehmann (1999), chapters 3, 4 and 7. A good example for a very informative online service is Global Voices Online, a community of over 400 bloggers and translators around the world who gather reports from blogs and citizen media ‘shining light on places and people other media often ignore’ (www.globalvoicesonline.org/about/). Most armed groups now tend to have their own websites on which they broadcast their own news and narratives. See Gowing (2009) and the multitude of people who contribute in times of crisis to networks such as Ushahidi, an open-source crisis-mapping platform where contributors post to the Ushahidi website during periods of violence or after natural disasters (www.ushahidi.com); and Heinzelman and Waters (2010). This section draws on Lehmann (2009), pp11–17. Following the UN experience in Rwanda and Burundi, there is heightened sensitivity in the international community about the need to block hate messaging. See also Tim Querengesser, ‘Cellphones spread Kenyans’ messages of hate’, The Globe and Mail, 29 February 2008. Luc Chounet-Cambas, Negotiating Ceasefires – Dilemmas and Options for Mediators, Mediation Practice Series (Geneva: Centre for Humanitarian Dialogue, March 2011), p33 (www.hdcentre.org/files/HDC_MPS3_EN_web_0.pdf). Public opinion surveys were externally commissioned by the UN on its operations in DR Congo, Burundi, Sierra Leone and Liberia. Written inputs by Susan Manuel who was, until June 2012, Deputy Director of Communications, UN Peacekeeping Mission in Darfur. Marianne Kearney, written inputs, May 2012. See Lindenmayer and Lianna Kaye (2009) for an in-depth analysis of the process, including Annan’s skilful handling of the media. 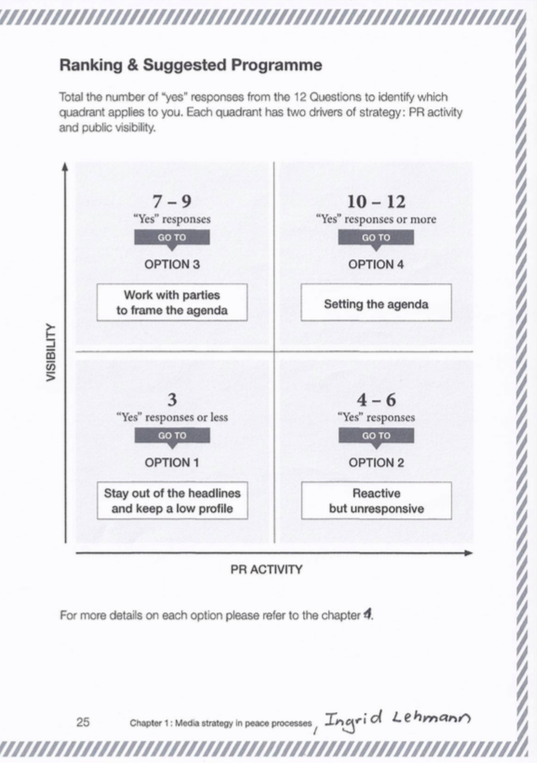 This ‘Peacemaker’s PR Matrix’ was designed by Mark Arena of the PR Verdict (www.theprverdict.com), a website tracking PR issues. Rights to reproduce this matrix and use it in the present publication have been gallantly shared by Mark Arena. This reminds me that communication and events are now intertwined; it is all “co-created” with all the stakeholders. There is no purveyor of information and consumer of it; we all participate together in our understanding of events. So it’s not just a move from one-way, broadcast style communications, to some kind of two-way sense of it; it really is a fray and while completely messy, it is in this fray that opinion and decisions are made, so it’s actually dangerous to sit out, broadcasting from on high. This is true for most interpersonal communications. However, as Mark and others keep pointing out, strategic goals must be identified and communicated with a variety of tools, after identifying various tactical options. Furthermore, we cannot assume that refugees and people in impoverished parts of the world have anything beyond simple cellphones and radios. The internet is not accessible to everyone, especially in war zones. So some have information monopolies while others are in information free zones.